Salimbene de Adam, the man who would become arguably the greatest chronicler of Italian medieval history, is said to have been born on this site in October 1221. The building one sees today is largely the product of an eighteenth century reconstruction (its façade most obviously an indication of this), but there’s little doubt that this is a house of considerable heritage. 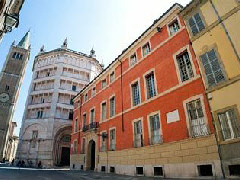 Today it offers a small range of 11 suites, rooms and apartments offering modern facilities in the historic setting of central Parma.